The need for a close supervision of trainees while learning the technique of diagnostic cervicocerebral angiography and the awareness of the factors that enhanced the risk of complications during this training period are discussed. Despite recent advances in noninvasive diagnostic neuroimaging, diagnostic cervicocerebral angiography (DCCA) remains the cornerstone and “gold standard” for the evaluation of patients with cerebrovascular disease. The number of neurointerventional physicians being trained and the number of hospitals offering their services have considerably increased in numbers.,,,,,,, Although technical progress and the use of non-ionic contrast medium has decreased the incidence of focal neurological complications, further training of residents may be needed to reduce the occurrence of embolic complications., This progress has led to an emphasis on finding innovative ways to teach catheter-based procedures outside of the laboratory. This study demonstrates the problems arising during the training of residents and fellows (RFs) in the technique of DCCA; it also emphasizes on ways to facilitate this learning process and to anticipate and avoid complications. We searched Medline for articles that could be identified using the keywords “cerebral”, “angiography” and “training” upto March 2016. We describe our experience and review the literature on how to avoid complications during the training for performance of a DCCA. A review of the complication rates in some of the most important and latest reports found that the risk of persistent neurological deficits as a result of DCCA ranges from 0.3–0.5%, and that there is a 2–3 fold increased risk of transient as compared to persistent neurological deficit. Patients with symptomatic atherosclerotic cerebrovascular disease (ipsilateral transient ischemic attack [TIA] or stroke) have a 2–3 fold higher risk of stroke from DCCA (that have a 0.5–5.7% risk of persistent deficits) as compared to asymptomatic lesions (that have a 0.1–1.2% risk of persistent deficits). No statistically significant difference could be found in neurological complication rates in patients who had vertebral injections or aortic arch injections (alone or in combination with carotid injections) and carotid injections alone., Complications are unusual in young patients. Factors that correlated with complications include the following: a history of cerebral infarction, the infusion of large amounts of contrast medium, a prolonged fluoroscopy time (>80 min), and the impact of the institution at which the resident or the fellow is being trained.,, The major transient neurologic complications were of of three definite types: 80% motor, 15% cortical blindness and 5% cerebellar. They occurred immediately after the manipulation of the guide wire or catheter, or on completion of an injection of contrast material. We presume that these complications were precipitated by the release of blood clots during the catheter and guide wire manipulations, as well as the release of atheromatous debris or microbubbles during the catheter exchanges as well as the recurrent changes of the syringe for instillation of saline or the dye through the catheter. The complication of cortical blindness may be an inherent risk of vertebral artery injection. An arterial dissection, a hematoma at the puncture site or a catheter fracture highlights the fact that insufficient skills at catheterization may be responsible for the clinical sequelae in the patients and may remain un- or under-reported. It is essential to address the latter factor to prevent the complication in the future [Figure 1] and [Figure 2]. Careful supervision of trainees, the usage of the vascular closure device (Cordis EXOSEAL ™), and the careful selection of the target artery using a guidwire can reduce the risk of these complications. The complications related to DCCA and their management are summarized in [Table 1]. In our center, almost all neurosurgery residents and fellows along with a few neurology and neuroradiology fellows perform the DCCA. 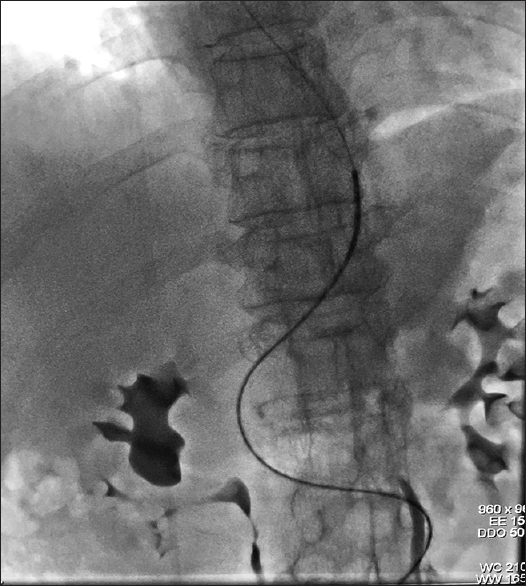 Retroperitoneal hemorrhage from a high femoral artery puncture was not encountered in our experience. 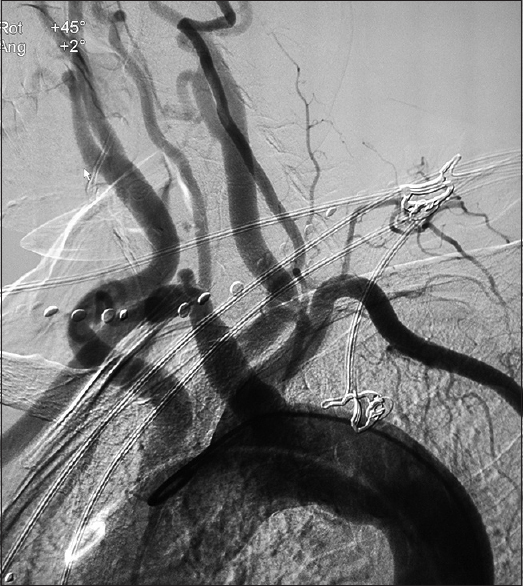 For patients with suspected carotid or vertebral artery stenosis, an injection in the common carotid, subclavian or brachiocephalic arteries, rather than selective injections in the stenosed blood vessels, can lower the complication rate. This action helps to avoid manipulation of the internal carotid artery and vertebral artery. 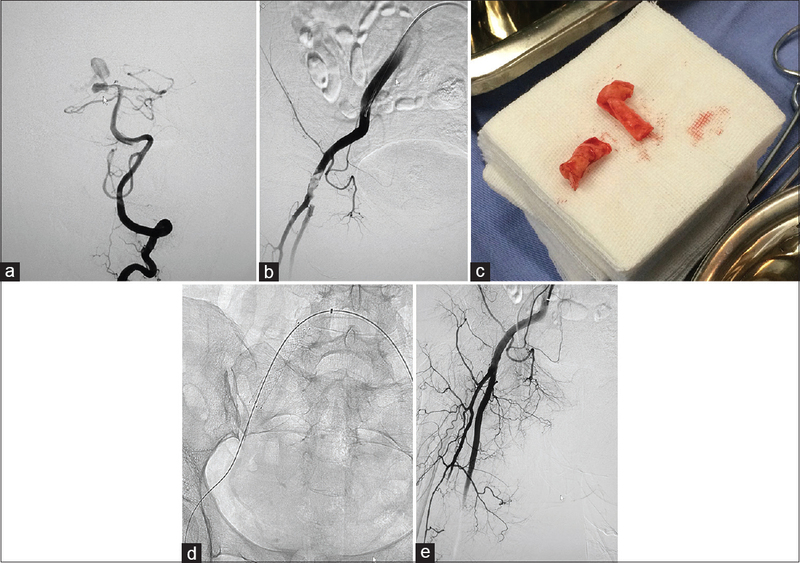 An endovascular specialist immediately became involved in the the DCCA procedure performed during the senior resident training, when the femoral artery puncture failed despite multiple attempts or when the vessel selection was difficult [Figure 3] and [Figure 4]. The supervisor pointed out the errors of the RFs during their training. The fluoroscopy time decreased significantly with specialty supervision and accumulation of experience in conducting the procedure. The main errors were as follows: the trainee (1) advanced the diagnostic catheter and guidewire with too much force and too quickly; (2) did not check for an air bubble in the “Y” valve and the injection syringe; (3) advanced the diagnostic catheter and guidewire outside the view provided by the fluoroscopic image; (4) did not select an appropriate image size and position; (5) did not create a roadmap and use a guidwire, which is a very important step to avoid arterial dissection and stroke; and, (6) on rotating the catheter with too much force, caused catheter fracture. Although endovascular interventions have become an essential part of a neurosurgeon's practice, endovascular procedures have not been effectively integrated into the residency curricula. Resident neurosurgeons have relatively few opportunities to perform a DCCA in most institutions. In a recent program, more than 50% of new fellows were unfamiliar with endovascular devices and angiographic equipment [Figure 5], and were unable to perform the procedure of femoral access, femoral closure, catheterization of a major vessel, and could not recognize the neurovascular anatomy and vascular abnormalities. Compared with the established protocols of training while obtaining the medical degree in USA/Europe, the diversity of the current degree-oriented medical education, and the multiple routes taken to acquire diverse kinds of medical degrees, also enhances the potential gaps in the training of neurosurgery RFs with regard to endovascular neurosurgery. There is no standardized curriculum currently available at most institutions for establishing procedural competence in trainees performing a DCCA. Although some fellowship programs have been lobbying for a reduction in the training requirements for RFs performing a DCCA, all collaborating neuroscience societies recommend an appropriately supervised DCCA training and accreditation, with an accumulated total of 100 DCCAs performed by the RFs before their post-graduate training is completed.,, Although a few studies have shown that the use of simulator training models improves resident performance with regard to the total procedure time and the total fluoroscopy time,, it does not make him/her proficient in the procedure of contrast injection or the roadmaps that need to be created. Various types of simulator models are available for DCCA training, but the feel during this artificial manipulation is not realistic, lacks the actual simulation of a series of clinical scenarios, such as the difficulties encountered during the right vertebral artery catheterization and the gaining of access to the femoral artery. The number of neurointerventional simulators available are also limited and there is lack of research in assessing their validity and training capability. Apprenticeship is the cornerstone of DCCA training., The residents can start gaining their clinical experiences under the strict supervision of senior surgeons. In imparting clinical education, the instructors train RFs not only to enhance their knowledge and skills in performing a DCCA, but in addition model their clinical behavior, which is of paramount importance in the teaching and assessment of clinical skills. Providing an organized curriculum to supplement learning under a graded supervision in DCCA is an important and useful step in the training. Our 6-month curriculum covers anatomical, clinical, and radiographic topics for the trainees. Although it is difficult to describe the usefulness of our clinical training, we believe that we provide enough good quality and quantity of clinical cases to the residents. As our endovascular team has more than 1000 interventional therapies and 2500 DCCAs performed every year, RFs can have the experience of more than 100 cases during their 6-month training program. The qualification requires that the applicant must have experienced more than 100 cases in a period from 6 months to 2 years. Therefore, our RFs can have enough case material to qualify the board examination. RFs should understand the anatomy of the inguinal area and the aortic arch before undertaking training in the DCCA procedure. During the catheter and guidwire manipulation, injection of the contrast medium for checking vessels or the catheter position is necessary. Not only the technical aspects of DCCA but also the cognitive topics, including neurovascular anatomy and basic principles of fluoroscopy should be learnt. Training fellows is a privilege for the trainer and getting adequately trained is also a prerequisite for the trainee. This relationship should be honest and it should always be kept in mind that the ultimate goal of both the trainer as well as the trainee is to optimize patient care. To ensure a good patient outcome, a decrease procedural time, being aware of and avoiding complications inherent in each step of the procedure and being able to obtain and discern good quality images should be the aim of DCCA training. Chalouhi N, Zanaty M, Tjoumakaris S, Manasseh P, Hasan D, Bulsara KR, et al. Preparedness of neurosurgery graduates for neuroendovascular fellowship: a national survey of fellowship programs. J Neurosurg 2015;123:1113-9. Connors JJ 3rd, Sacks D, Furlan AJ, Selman WR, Russell EJ, Stieg PE, et al. NeuroVascular Coalition Writing Group; American Academy of Neurology; American Association of Neurological Surgeons; American Society of Interventional and Therapeutic Radiology; American Society of Neuroradiology; Congress of Neurological Surgeons; AANS/CNS Cerebrovascular Section; Society of Interventional Radiology. Training, competency, and credentialing standards for diagnostic cervicocerebral angiography, carotid stenting, and cerebrovascular intervention: A joint statement from the American Academy of Neurology, American Association of Neurological Surgeons, American Society of Interventional and Therapeutic Radiology, American Society of Neuroradiology, Congress of Neurological Surgeons, AANS/CNS Cerebrovascular Section, and Society of Interventional Radiology. Radiology 2005; 234:26-34. Ecker RD, Levy EI, Hopkins LN. Workforce needs for endovascular neurosurgery. Neurosurgery 2006; 59 (5 Suppl 3):S271-S313. Fargen KM, Arthur AS, Bendok BR, Levy EI, Ringer A, Siddiqui AH, et al. Experience with a simulator-based angiography course for neurosurgical residents: Beyond a pilot program. Neurosurgery 2013;73(Suppl 1):46-50. Jabbour P, Fiorella D. Are we training too many neuroendovascular fellows? World Neurosurg 2013;79:9-10. Layton KF. Decreasing the diagnostic cerebral angiogram requirements for neuroradiology fellows would be a mistake. AJNR Am J Neuroradiol 2006; 27:1601-2. Lui YW, Farinhas JM, Basalely AM, Hsu KA, Freeman K, Bello JA. Assessment of an introductory cervicocerebral catheter angiography learning program: A pilot study. AJNR Am J Neuroradiol 2012;33:1041-5. Nicholson WJ, Cates CU, Patel AD, Niazi K, Palmer S, Helmy T, et al. Face and content validation of virtual reality simulation for carotid angiography: Results from the first 100 physicians attending the Emory NeuroAnatomy Carotid Training (ENACT) program. Simul Healthc 2006; 1:147-50. Sato M, Nakai Y, Tsurushima H, Shiigai M, Masumoto T, Matsumura A. Risk factors of ischemic lesions related to cerebral angiography and neuro-interventional procedures. Neurol Med Chir (Tokyo) 2013;53:381-7. Leffers AM, Wagner A. Neurologic complications of cerebral angiography. A retrospective study of complication rate and patient risk factors. Acta Radiol 2000;4:204-6. Mani RL, Eisenberg RL. Complications of catheter cerebral arteriography: Analysis of 5,000 procedures. III. Assessment of arteries injected, contrast medium used, duration of procedure, and age of patient. AJR Am J Roentgenol 1978;131:871-4. Mani RL, Eisenberg RL, McDonald EJ Jr, Pollock JA, Mani JR. Complications of catheter cerebral arteriography: Analysis of 5,000 procedures. I. Criteria and incidence. AJR Am J Roentgenol 1978;131:861-5. Shin DS, Yeo DK, Hwang SC, Park SQ, Kim BT. 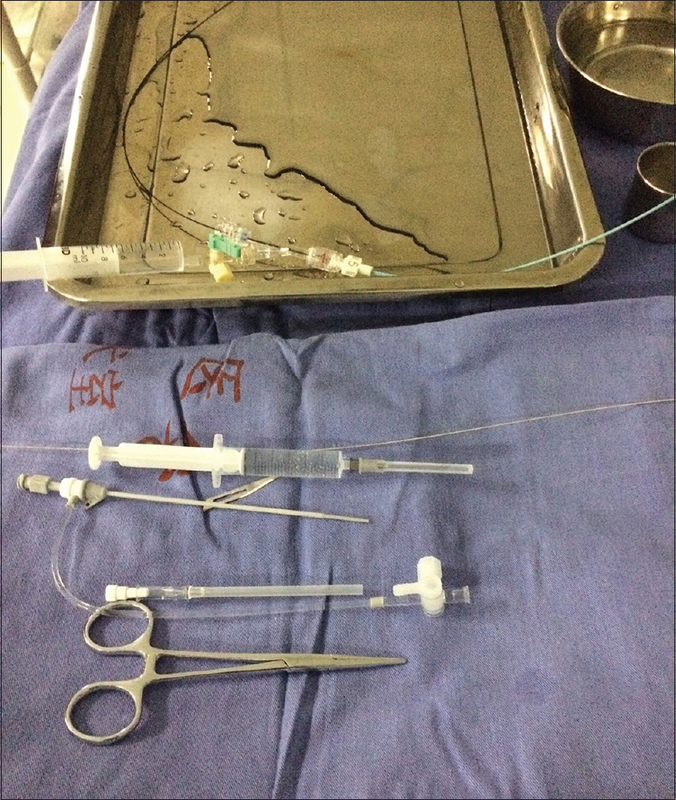 Protocols and results of resident neurosurgeon's transfemoral catheter angiography training supervised by neuroendovascular specialists. J Korean Neurosurg Soc 2013;54:81-5. Wu L, Wang Y, Peng X, Song M, Guo X, Nelson H, Wang W. Development of a medical academic degree system in China. Med Educ Online 2014; 19:23141. Lv X, He H, Wu Z. China's medical education and interventional neuroradiology training. World Neurosurg 2015;84:1462-5. Spiotta AM, Rasmussen PA, Masaryk TJ, Benzel EC, Schlenk R. Simulated diagnostic cerebral angiography in neurosurgical training: A pilot program. J Neurointerv Surg 2013;5:376-81. Zaika O, Nguyen N, Boulton M, Eagleson R, de Ribaupierre S. Evaluation of user performance in simulation-based diagnostic cerebral angiography training. Stud Health Technol Inform 2016;220:465-8. Nguyen N, Eagleson R, Boulton M, de Ribaupierre S. Realism, criterion validity, and training capability of simulated diagnostic cerebral angiography. Stud Health Technol Inform 2014;196:297-303. Suzuki Y, Fujitsuka M, Chaloupka JC. Simulation of endovascular neurointervention using silicone models: Imaging and manipulation. Neurol Med Chir (Tokyo) 2005;45:567-73.